Left to right: the 2018 Women's and Queer Honi Soit covers. 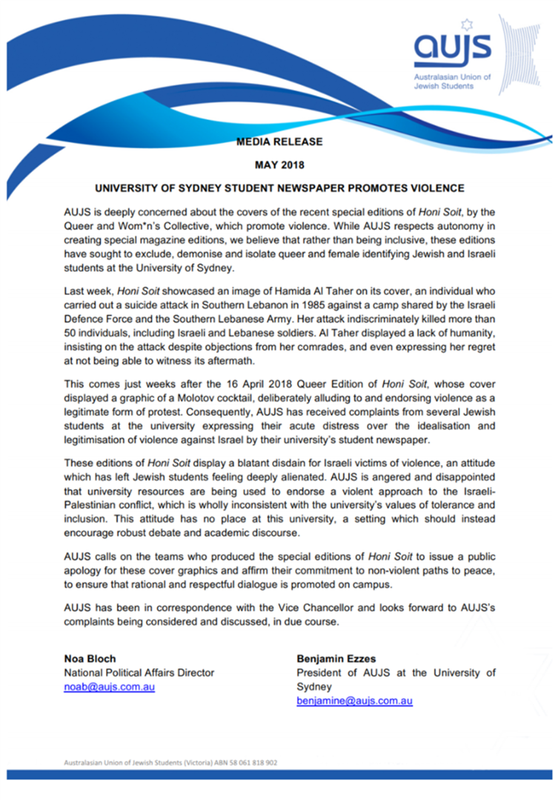 The Australasian Union of Jewish Students (AUJS) are calling for a public apology from the SRC’s Women and Queer officers regarding their choice of cover graphic for this year’s Women and Queer editions of Honi Soit. In a media release published today, AUJS claimed the Queer Honi cover, which includes a graphic of a Molotov cocktail, is deliberately “endorsing violence as a legitimate form of protest”. Additionally, the organisation criticises the cover of Women’s Honi Soit for showcasing an image of Arab Ba’ath Party member Hamida Mustafa al-Tahir, who in 1985 committed a suicide bombing in an Israeli military base in Lebanon. AUJS said the attack killed 50 individuals, including Israeli and Lebanese soldiers. A New York Times article published at the time put the death toll to at least 20 Israeli officers and members of the Israeli-supported Southern Lebanon Army. As per section 4(e) and 4(f) of the SRC Constitution, two issues of Honi Soit are each year reserved for an autonomous Queer and Women’s edition, created with the help of an open collective of students who belong to the identity being represented. The ten elected editors of Honi Soit are historically not involved in the creation of these special editions. AUJS have sent their complaints directly to the Vice-Chancellor’s office, which has since redirected the matter to Peter MacCallum, Director, Education and Strategy Acting Registrar. It is unclear what the outcome will be as the publication of Honi Soit, including its special editions, is not regulated or managed by the University. A previous version of this article stated AUJS accused the collectives of anti-semitism. This has been corrected.